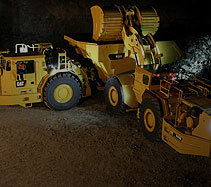 Formerly known as CAES (Computer Aided Earthmoving System) and CAESUltra for Mining, Terrain for grading is a state-of-the-art machine guidance system that delivers real-time productivity information to operators of mine site grading equipment. Terrain features an in-cab display, satellite navigation technology, machine-mounted components, a radio network and fully-integrated office software. Terrain for grading gives operators the information they need to maximize the efficiency of their machines by monitoring ore bodies, bench height, cycle times and volume of material cut and filled. The system is available for use on scrapers, dozers, motor graders and large track-type tractors. Terrain improves safety by giving machine operators and mine controllers a digital display of avoidance zones and avoidance surfaces, based on real-time tracking. It also offers valuable tools for material identification, mine planning, engineering, surveying, ore grade control and production monitoring. The system uses GNSS technology, a wireless radio communication network, and office software to map mines, create terrain models, locate a machine's position, and track volume and productivity with complete accuracy. The in-cab display then provides the operator with an overhead and cross- sectional three-dimensional surface view of the color-coded work plan and precise machine location. The system continuously updates material and machine position information as the machine traverses the site. Integrated office software combines the functions for drilling, dragline, grading and loading operations, providing valuable productivity tools that allow users to create reports on utilization, materials and volumes. Sitemap | Terms & Conditions | © 2017 CB Mining, Pennsylvania. All Rights Reserved.